Every bit as brilliant as you've been told, I honestly do consider this the finest mythology of the last century in any medium. 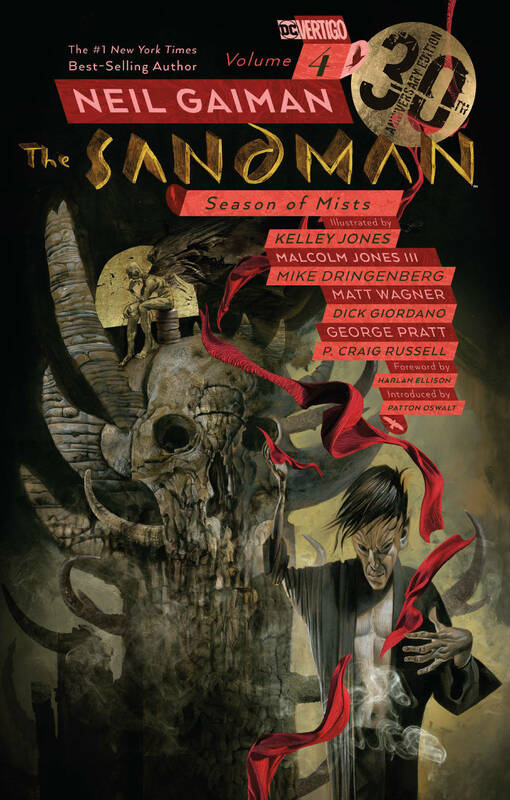 ALERT: the first re-coloured trade dress of SANDMAN volumes 1 to 10 is fast slipping out of print, so if you're halfway through I strongly suggest you pick the rest up right now. At the time of typing we still have volumes 2 to 10, and will keep them in stock for as long as they remain available. If you've yet to experience this exceptional epic, there have been five 30th Anniversary Edition volumes so far, all in stock. 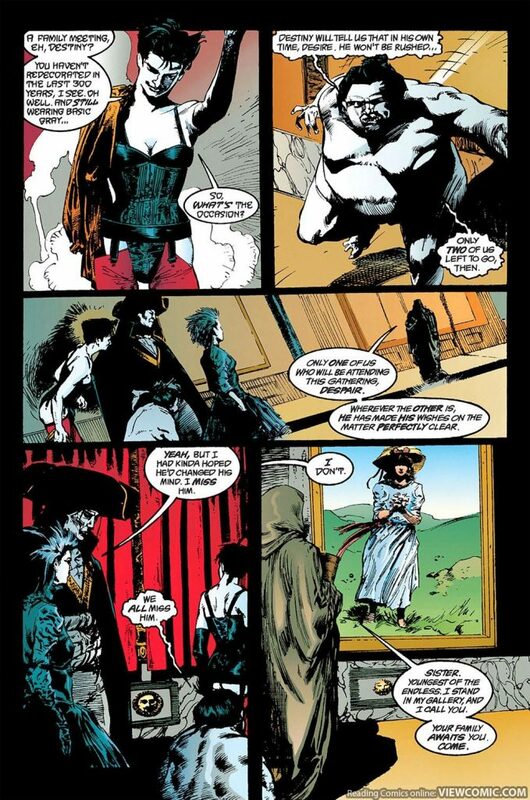 Gaiman's most recent return to the series, SANDMAN: OVERTURE with PROMEHEA's JH Williams III on art matches neither trade dress, so you can add that whenever you fancy. Morpheus is the Lord of Dreams, his family are The Endless. Each of them is older than you can comprehend, though some are older than others. They are as gods to mortals - though they can surely die - and they change as we change, for they are reflections of our everyday existence. Destiny, cowled and quiet, holds in his hands the book of all that is, all that was, and all that will ever be. Dream, his skin as white as the moon, his clothes the colour of midnight, is remote and cold and unforgiving, meticulous in his duties, obsessive when in love. By contrast, Death, his older sister, is kind and compassionate and far better company than you'd image, although one day you'll discover that for yourself. Desire is fickle but irresistible: he/she will appear as the most beautiful woman or man you have ever seen, whereas their twin, Despair, is terrible to behold and terrible to endure. 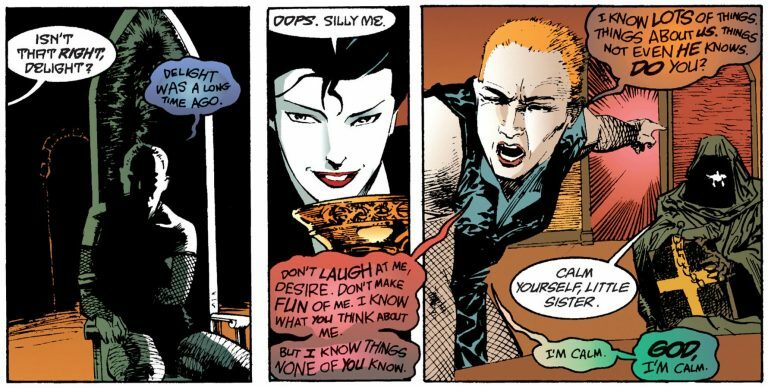 Delirium doesn't know what she is for most of the time, but in her rare, lucid moments she remembers many things, most tragically, perhaps, that she used to be Delight. But we are no longer content with mere joy - we demand it on drugs - and so Delirium she has become. They are a family, like the Greek gods, and like most families they squabble, they fight and fall out. Over the course of ten books and now prequel Neil Gaiman introduces us to The Endless and their roles in Morpheus' story. This will draw him to Hell and back via ancient Africa, the East and Greece, Elizabethan England, the dreams of cats, a city preserved inside a bottle, and an American serial killer convention. It's quite like a comicbook convention, only for psychopaths who get together and swap top tips. You'll meet Norse and Egyptian deities, demons and angels, Lucifer, Shakespeare, Barbie and Ken, Orpheus, the Faerie, and a host of contemporary individuals as they come into contact with Dream and his siblings, for The Endless have always played a role in our lives - often benign, sometimes less so - and none of them are above making mistakes. Overwhelmingly this is a story about stories and story telling, about decisions and consequences, responsibility, growth and the power of dreams.